This Serpentine exhibition focused primarily on af Klint's body of work, The Paintings for the Temple, which dates from 1906–15. The sequential nature of her work was highlighted by the inclusion in the exhibition of numerous paintings from key series, some never-before exhibited in the UK. After graduating from the Royal Academy of Fine Arts in Stockholm in 1887, af Klint took a studio in the city where she produced and exhibited traditional landscapes, botanical drawings and portraits. However, by 1886 she had abandoned the conventions she learned at the Academy in favour of painting the invisible worlds hidden within nature, the spiritual realm and the occult. She privately joined four other female artists to form a group called ‘The Five’. They conducted séances to encounter what they believed to be spirits who wished to communicate via pictures, leading to experiments with automatic writing and drawing, which pre-dated the Surrealists by several decades. In 1905, af Klint received a ‘commission’ from an entity, which the group named Amaliel, to create her most important body of work, The Paintings for the Temple. Consisting of 193 predominately abstract paintings in various series and subgroups, the artist painted a path towards a harmony between the spiritual and material worlds; good and evil; man and woman; religion and science. This major work charted the influence of science and religion on af Klint’s works, from the discovery of electromagnetic waves to the spiritual teachings of anthroposophist Rudolf Steiner. Steiner was af Klint’s mentor and his presence in her life resulted in the cycle becoming more orderly with depictions of symbols and motifs, such as shells, snakes, lilies and crosses, from his spiritual movement. Hilma af Klint painted in near isolation from the European avant-garde. Fearing that she would not be understood, she stipulated that her abstract work should be kept out of the public eye for 20 years after her death. While the works were not exhibited for a further 20 years, it subsequently came to be understood alongside the broader context of modernism at the turn of the 20th century. The exhibition was co-curated by the Serpentine Galleries in collaboration with Daniel Birnbaum, Director of Moderna Museet, Stockholm. The artist has subsequently been exhibited at The Drawing Center, New York (2005–6); Santa Monica Museum of Art (2005–6); Irish Museum of Modern Art, Dublin (2005–6); Camden Arts Centre, London (2006); Bochum Kunstmuseum (2008); Moderna Museet, Stockholm (2008); Centre Pompidou, Paris (2008); Centre Culturel Suédois, Paris (2008); Haus der Kunst, Munich (2009); Museum voor Moderne Kunst, Arnhem (2010); and at the Central Pavilion of the 55th Venice Biennial (2013). 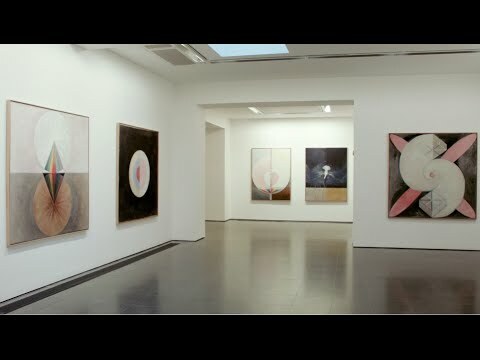 Her work has also been subject to a major touring exhibition, Hilma af Klint – a Pioneer of Abstraction, which was organised by and shown at Moderna Museet, Stockholm in 2013, before touring to Hamburger Bahnhof, Berlin (2013); Museo Picasso Málaga (2013–4); Louisiana Museum of Modern Art, Humlebæk (2014); and Henie-Onstad Art Centre, Oslo (2015). The Serpentine presented the first major exhibition of work by Kerstin Brätsch and Adele Röder in a UK public institution. Brätsch and Röder are based in New York and London. While each has her own practice, the artists have worked collaboratively as DAS INSTITUT since 2007.